ALERT: At least two people were shot dead Friday during a hostage-taking drama at a Jewish supermarket in eastern Paris, where at least five people were being held, official sources told AFP. “There are at least two dead, maybe more, but for the moment we don’t know,” one source said. French officials suspect a man responsible for the murder of a policewoman in the street of a southern Paris suburb on Thursday could be the hostage-taker. ALERT: French police release mugshots of man and woman linked to policewoman killing. This is breaking news. Check back for updates. Earlier story below. French elite forces surrounded two brothers suspected of slaughtering 12 people in the Islamist massacre at Charlie Hebdo as a fresh shooting and hostage drama erupted at a kosher supermarket Friday in eastern Paris. Snipers were deployed on roofs and helicopters swooped low over a small printing business in the town of Dammartin-en-Goele, only 12 kilometres (seven miles) from Paris’s main Charles de Gaulle airport. Police sources said there was a “connection” between this gunman and the brothers accused of carrying out France’s bloodiest massacre in half a century at the Charlie Hebdo offices. One witness described coming face-to-face at the printer’s with one of the suspects, dressed in black, wearing a bullet-proof vest and carrying what looked like a Kalashnikov. 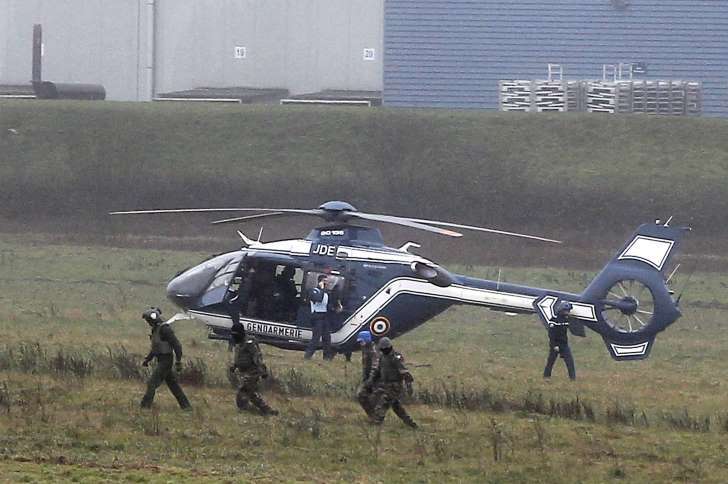 © Christian Hartmann/Reuters Members of the French gendarmerie intervention forces arrive at the scene of a hostage-taking at an industrial zone in Dammartin-en-Goele, northeast of Paris, January 9, 2015. “My daughter told me: ‘Don’t be scared mummy, we’re well protected. She was calm but me, I’m scared. I’m really scared,” said the woman. Prior to the standoff, the suspects had hijacked a Peugeot 206 nearby from a woman who said she recognised them as the brothers, , accused of killing 12 people in Wednesday’s attack on Charlie Hebdo, which repeatedly lampooned the Prophet Mohammed. Two Air France planes were forced to abort their landing at Paris’s main Charles-de-Gaulle airport and go round again ‘due to the presence of helicopters… flying over the zone at low-altitude,” the airline said. © Michel Spingler/AP Photo Ambulances try to make their way to Dammartin-en-Goele, northeast Paris, as part of an operation to seize two heavily armed suspects, Jan. 9, 2015.